F Jamie Lundmark (Moose Jaw, Seattle, 1998-2001) has signed a one-year extension with Klagenfurt (Austria, Erste Bank Liga). This season, in 51 games, he had 26 goals and 25 assists. He led the team in goals and points, while serving as an alternate captain. The mumps may not yet be through with the WHL. Jon Keen, the voice of the Kamloops Blazers on Radio NL, wasn’t available for Game 4 of a series with the Kelowna Rockets on Wednesday night. Jeremy Bosch, who usually rides shotgun with Keen on home games, handled the play-by-play with Marty Hastings of Kamloops This Week providing the analysis. During the game, Taking Note was told by three sources that Keen has shown symptoms of mumps and has been placed in isolation awaiting test results. Keen is in his 14th season as a play-by-play voice in the WHL. Keen began his WHL career with the Swift Current Broncos before moving to Kamloops. He called his 1,000th game on March 8. With the playoffs here, the Blazers, like other teams, have shut down the information highway, so it’s not known if there is anyone else in the organization with symptoms. It could be that the Blazers are at least the sixth WHL team to be hit by the mumps, following the Brandon Wheat Kings, Medicine Hat Tigers, Seattle Thunderbirds, Swift Current Broncos and Victoria Royals. The WHL’s defending champions bowed out last night in Dauphin, Man. The Medicine Hat Tigers beat the Brandon Wheat Kings, 3-2, to sweep the holders of the Ed Chynoweth Cup from the first round. . . . The Wheat Kings played all four games without F Nolan Patrick, who was injured in the second-last game of the regular season. . . . Brandon also was without veteran F Tanner Kaspick. . . . Patrick ended up playing only 33 games this season, putting up 46 points, including 20 goals. He underwent sports hernia surgery in July and missed almost all of training camp. He returned for the season’s first five games, then didn’t play again until Jan. 14. . . . He has been projected as the consensus No. 1 selection for the NHL’s 2017 draft through the entire season. It will be interesting to see if that holds up on June 23 in Chicago. The Tri-City Americans were without D Dalton Yorke, 20, for Game 3 of their series with the Seattle Thunderbirds on Wednesday night. Yorke drew a TBD suspension for a hit he delivered during the Game 2’s third period in Kent, Wash., on Saturday night. Yorke took a charging minor at 15:10 for a hit on F Ryan Gropp, who was scratched last night. The suspension came under supplemental discipline, meaning the Thunderbirds sent video to the league and asked for a review. When it comes to supplemental discipline, the injury factor carries a lot of weight. . . . 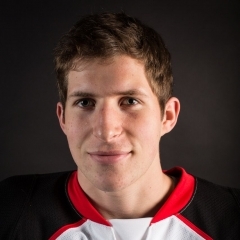 While Yorke was scratched last night, F Vladislav Lukin returned to the Americans after missing Game 2. Tri-City also had F Nolan Yaremko back for this one. He missed the end of the regular season and the first two games of this series after being injured in practice. The Thunderbirds, meanwhile, again were without F Mathew Barzal and G Rylan Toth as they took a 2-0 edge into Game 3 last night. Barzal (mumps) hasn’t played since March 7. Barzal, the Western Conference’s player of the year, took the warmup prior to a March 10 game, then left for the dressing room before the anthem. Barzal hasn’t played since then. . . . Toth, who led WHL goaltenders with 36 victories in the regular season, was taken out of a game in Portland on March 11. At the time, it was said to have been for precautionary reasons. 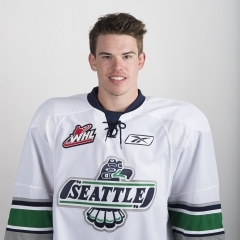 He hasn’t played since then. . . . F Ryan Gropp, who apparently was injured in Game 2 on a hit from Tri-City D Dalton Yorke, led the Thunderbirds in goals (35) and points (84) in the regular season. Ahh, the games inside the playoff games! The playoffs are here so when a coach says that an injured player is OK and “he’ll be fine,” well, you take it with a grain of salt. . . . On Sunday, F Giorgio Estephan of the host Lethbridge Hurricanes left in the second period after taking a high-stick from F Michael Spacek of the Red Deer Rebels. Lethbridge head coach Brent Kisio told Dale Woodard of the Lethbridge Herald: “He’s fine. He’s good to go.” . . . Estephan was scratched from Game 3 in Red Deer last night. One player who was in the lineup last night in Red Deer was Rebels captain Adam Musil. He hadn’t played since March 4. The next day, he suffered an undisclosed injury in an off-ice incident — he later was seen with a walking boot on an ankle — and was listed as being out week-to-week. The Vancouver Giants didn’t make the playoffs, but that doesn’t mean they aren’t hard at work. On Wednesday, they announced the signing of F Cyle McNabb, a list player from Winnipeg. McNabb, who will turn 17 on Sept. 15, spent this season with the Rink Hockey Academy’s prep team, putting up nine goals and 16 assists in 29 games. F Travis Jost has signed a three-year entry-level contract with the Colorado Avalanche, which selected him 10th overall in the NHL’s 2016 draft. This means Jost, who played two seasons with the BCHL’s Penticton Vees, will leave the U of North Dakota Fighting Hawks after just one season. The Regina Pats hold his WHL rights, having acquired them from the Everett Silvertips. The Pats will be the host team for the 2018 Memorial Cup. Hmmm . . . It was a tough day for hockey at North Dakota. Earlier in the day, word got out that the school is axing its women’s program. The team was practising at the time that word leaked. . . . Brad E. Schlossman of the Grand Forks Herald, who covers UND hockey like sand covers a beach, reported that the women’s team had a recruit on campus at the time. Lauren Hennessey had left Boston at 5 a.m., for her UND visit. . . . The announcement came one day after USA Hockey reached an agreement with its women’s national team that averted a boycott of the IIHF World Championship that is to begin Friday in Plymouth, Mich. . . . UND also will be dropping men’s and women’s swimming and diving teams. The junior B Mission City Outlaws of the 10-team Pacific Junior Hockey League announced Wednesday that co-coaches Mike Drouillard and Brad Veitch have retired. Veitch spent five years with the Outlaws; Drouillard was there for four seasons. . . . The Outlaws then named Mike Renner as their new head coach. Earlier in the day, the PJHL’s Port Moody Panthers had announced that Renner, the team’s interim head coach, wouldn’t be returning. That was announced by Peter Zerbinos, who took over as general manager on March 16. The Panthers finished 16-27-1 this season, putting them fifth in the five-team Tom Shaw Conference. . . . Mission was 18-22-4, which left it fourth in the Harold Brittain Conference. over the Lethbridge Hurricanes. . . . The Rebels hold a 2-1 lead in the series with Game 4 scheduled for tonight in Red Deer. . . . The Rebels scored the game’s last three goals, winning it on Polei’s second of the series. 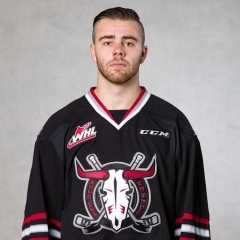 This was the first OT game of these WHL playoffs. . . . F Lane Zablocki had given Red Deer a 1-0 lead with a PP goal at 2:44 of the first period. . . . The Hurricanes stormed back with three straight goals. . . . F Tyler Wong (2) scored on a PP at 8:51. . . . D Brennan Menell (1) gave the visitors the lead at 18:57 of the second period. . . . F Zak Zborosky (1) upped the lead to 3-1 at 3:10 of the third period. . . . F Brandon Hagel (2) scored on a PP at 16:53, getting the Rebels to within one goal. . . . Red Deer tied it when Zablocki scored his third goal of the series with 19.6 seconds left in the third period. . . . The Rebels got three assists from D Jared Freadrich and two from Polei. . . . Wong had two assists for Lethbridge, with Menell and Zborosky adding one each. . . . G Riley Lamb stopped 49 shots for the Rebels, four more than Lethbridge’s Stuart Skinner. . . . Red Deer was 2-5 on the PP. . . . The Hurricanes were 1-2 on the PP. They had been 0-12 before Wong scored. . . . Announced attendance: 5,017.
and can end it Friday in Kennewick. . . . The Americans switched goaltenders, going from Rylan Parenteau, who had started the first two games (0-2, 4.65, .875), and bringing Evan Sarthou off the bench. 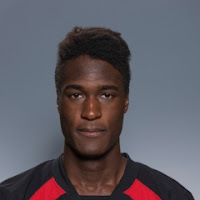 But Sarthou was lifted before the game was 11 minutes old, having allowed three goals on seven shots. . . . Bear, who finished with two goals and three assists, opened the scoring at 2:55. . . . F Scott Eansor (2) made it 2-0 at 7:48 and D Jarret Tyszka (1) upped it to 3-0 at 10:16. . . . Neuls, who scored his second goal and added four helpers, made it 4-0 at 12:03, with D Austin Strand (2) increasing the lead to 5-0 at 17:08. . . . Seattle also got goals from F Keegan Kolesar (3) and F Alexander True (1), with Bear later adding his second of the game and second of the series and Strand scoring his third. . . . F Austyn Playfair (2) and F Morgan Geekie (1) scored for the Americans. . . . 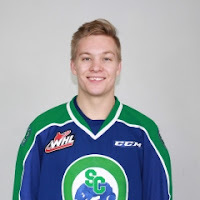 True and Kolesar added three assists each. . . . Seattle G Carl Stankowski stopped 21 shots in running his record to 3-0 in relief of injured starter Rylan Toth. . . . Parenteau allowed six goals on 29 shots in 49:44. . . . Seattle was 3-7 on the PP; Tri-City was 0-4. . . . Announced attendance: 2,632. Defeating the @TCAmericans 9-2, the @SeattleTbirds tied a team record for goals in a playoff game with 9. Winterhawks have lost 5 straight home playoff games going back to 2015, still well short of team record of 10 from 2006-2010.
a 6-1 victory over the Winterhawks. . . . The Cougars lead the series, 2-1, with Game 4 scheduled for tonight in Portland. They’ll be back in Prince George for Game 5 on Saturday. . . . F Skyler McKenzie (2) gave the Winterhawks a 1-0 lead just 14 seconds into the first period. Who knew the home side wouldn’t score again? . . . Harkins (2) tied it at 8:26 and F Kody McDonald (1) put the Cougars out front, on a PP, at 12:36. . . . F Colby McAuley (1) scored at 17:42 for a 3-0 lead. . . . D Tate Olson (1), F Brogan O’Brien and McAuley (2) added Prince George’s other goals. . . . D Brendan Guhle and F Nikita Popugaev each had two assists for the winners, with McAuley getting one. . . . The Cougars got 37 stops from G Ty Edmonds. . . . Portland starter Cole Kehler allowed six goals on 38 shots in 47:35. Shane Farkas finished up by stopping all seven shots he faced in 12:25. . . . Prince George was 2-5 on the PP; Portland was 0-6. . . . Announced attendance: 4,585.
minutes of the third period en route to a 3-2 victory over the Brandon Wheat Kings. . . . The Tigers swept the best-of-seven series and eliminated the defending champions. . . . Medicine Hat had a 37-15 edge in shots through two periods but couldn’t get the puck past Brandon G Logan Thompson. . . . D Clayton Kirichenko finally solved Thompson, scoring his third goal of the series 24 seconds into the third period. . . . D David Quenneville made it 2-0 at 1:31. . . . F Reid Duke got Brandon to within a goal, on a PP, at 3:11. . . . Quenneville replied with his third goal of the series, on a PP, at 12:09. . . . The Wheat Kings got another PP goal, this one from D Kale Clague (1), at 15:48. . . . The Tigers got 23 saves from G Michael Bullion, who went the distance in all four games. . . . Thompson finished with 51 saves. . . . Brandon was 2-4 on the PP; Medicine Hat 1-5. . . . The Wheat Kings took their first-round home games to Credit Union Place in Dauphin because the Royal Manitoba Winter Fair has taken over the Keystone Centre complex. . . . Announced attendance: 1,825. Prior to tonight, last time the @Kelowna_Rockets won a playoff game at Sandman Centre, a guy named Jamie Benn had 1+3=4 in a 5-3 win. the Blazers. . . . The Rockets lead the series, 3-1, with a chance to end it at home on Friday night. . . . 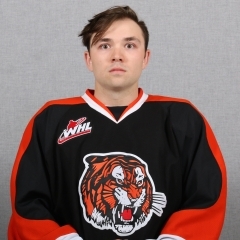 Exactly on year earlier, on March 29, 2016, Herringer stopped 40 shots in a 1-0 victory in Kamloops. . . . Last night, Herringer saved the victory with a terrific push across save on Kamloops F Collin Shirley late in the third period. Herringer was trying to smother the puck on the right side of his crease, when it squirted loose. Shirley corralled it behind the net and came out the other side. Herringer somehow got his left pad to the post and stopped the stuff attempt. . . . Herringer now has two shutouts in this series — the Rockets won the opener, 4-0 — and four in his post-season career. . . . Dillon Dube, the best forward on the ice in this one, scored the game’s only goal, at 2:37 of the second period. He’s got three goals in the four games. . . . Kamloops G Connor Ingram put on quite a show, stopping 48 shots. The Rockets held a 40-14 edge in shots after two periods. . . . Steve Yzerman, the general manager of the Tampa Bay Lightning, was in the house. The Lightning selected Ingram in the third round of the NHL’s 2016 draft. . . . Kelowna was 0-3 on the PP; Kamloops was 0-7. . . . The Blazers, who beat the visiting Rockets 4-1 on Tuesday night, now are 1-20 on the PP in the four games. . . . The Blazers remain without F Luc Smith, who was hurt in the second-last game of the regular season. . . . Announced attendance: 4,297. 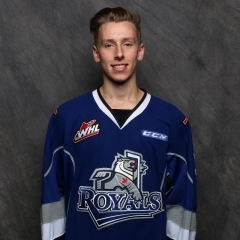 At Victoria, G Griffen Outhouse turned aside 30 shots as the Royals beat the Everett Silvertips, 2-1. . . .
That series is 2-2 as it heads back to Everett for Game 5 on Friday. Game 6 is scheduled for Victoria on Sunday. . . . Last night, F Regan Nagy (1) gave Victoria a 1-0 lead at 5:03 of the first period and F Dante Hannoun (1) made it 2-0 at 19:16 of the second. . . . Everett got within a goal when F Patrick Bajkov scored his fourth goal of the series, on a PP, at 16:05 of the third period. . . . Everett held a 10-7 edge in shots in the first period and 11-7 in the second. . . . The Silvertips got 18 saves from G Carter Hart. . . . Everett was 1-4 on the PP; Victoria was 0-3. . . . The Royals again played without F Jack Walker and D Scott Walford, both of whom have undisclosed injuries. . . . The Silvertips continue to be without F Riley Sutter and F Devon Skolenski, who also have undisclosed injuries. Sutter is believed to be close to returning. . . . Announced attendance: 4,637. Jaw Warriors. . . . The series is tied 2-2 as it heads back to Moose Jaw for Game 5 on Friday night. They’ll be back in Swift Current for Game 6 on Saturday. . . . The Broncos took control with three goals in the first nine minutes of the first period. . . . Lindgren scored twice, at 0:59 and 2:03, with F Tyler Steenbergen making it 3-0 at 8:57. . . . The Warriors made it interesting with a pair of early second-period PP goals, F Brett Howden (1) counting at 1:16 and D Josh Brook (1) finding the range at 2:25. . . . Steenbergen added his fourth goal of the series, on a PP, at 18:57 of the third period. . . . Lindgren iced it with his third goal of the game, and fourth of the series, on a PP, at 19:45. . . . The Warriors got two assists from each of F Jayden Halbgewachs and F Brayden Burke. . . . Swift Current got 30 stops from G Jordan Papirny, while Moose Jaw’s Zach Sawchenko turned aside 20. . . . The Broncos were 2-3 on the PP; the Warriors were 2-6. . . . Announced attendance: 2,890. . . . Darren Steinke, the travelling blogger, was on hand for this one. His blog is right here.